Scouts staged their annual Bonfire Night celebrations at the Scouts HQ in the village on 5 November, raising £850 towards a £30,000 project to improve the HQ. Despite the wet weather over 1000 people enjoyed the spectacular display. Former engineer Ian Whitehead has been installed as the new Rector of Rolleston and vicar of Anslow. Ian, 36, who is married with two young children, replaces the Rev Malcolm Birt, who moved to Cumbria with his wife, Beryl, after his retirement in April. Pupils from John of Rolleston Primary School have scored top marks from judges with their entries for a Staffordshire wide environment award. Teachers from the Chapel Lane school submitted a folder of children's green projects to the Community Council for Staffordshire which organised the competition and was open to all Staffordshire schools with pupils aged between five and eleven. The school was presented with its £250 prize at a ceremony in Stafford on 7 October. Gardener Philip Gould, of Marston Lane, is celebrating after coming up trumps in the East Staffordshire in Bloom competition for his Cricket World Cup themed garden. He won the best garden using organic methods and best overall front garden. A village resident, John Parker of' Twentylands, who is an experienced amateur video maker and prize winner at national competition level, has offered to produce a video which will reflect the history, landscape, buildings, people and activities of the village, as part of the Millennium celebrations. He is working to cover the full village calendar; and all the seasons of' the year. The committee would be very grateful for residents' support in informing him of events, houses or other features of' interest which might form part of this valuable record of the last year of this Millennium. ON Saturday, June 26 Rolleston Scout Group will be celebrating the first 10 years in the new headquarters, which were officially opened by the Princess Royal in 1989. There will he a barbecue on the Scout field and musical entertainment in the evening, so do come along and enjoy yourselves. 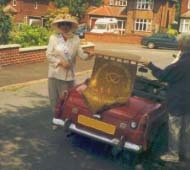 June 20, 1999 will be Rolleston-on-Dove's ninth Open Gardens Sunday, held as usual to raise funds for St Mary's Parish Church. Over the last nine years a pattern has been established of alternate June and July openings to give a variety in the types of flowers to be seen in the gardens. This year's June opening should be ideal for the earlier herbaceous plants. Last year Rolleston was again the winner of the Borough in Bloom Burtotex Cup for the village with the six best gardens some of which will be open, come and see them and some of the others. As always we aim to provide a good variety of garden types and this year include two gardens that have not been involved with the occasion before. One, a well established garden containing shrubs, trees and herbaceous plants, and the other a "garden in the making" - a garden which is being extended containing pond, wildlife area borders, vegetables etc. We are also pleased to welcome a garden that has not been seen for a number of years containing a delightful water feature as well as lovely borders, Other attractions include a variety of goats at the smallholding, the garden belonging to the winner of last year's Rolleston Civic Trust Award for the best Spring Garden and Rolleston Allotments. All well worth a visit to say nothing of the tea, cake and plant stalls. Artists from the Rolleston Gallery will be displaying some of their work and there will be music in the church during the afternoon. 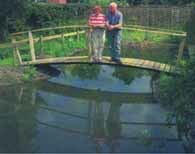 Dave and Pam Cawser's garden, with a Monet bridge is one of the gardens well worth a visit. The event runs from 1-6pm and programmes (£1.50) giving entrance to all tbe gardens will be available in advance from local shops or from the church lychgate on the day. The Friends of John of Rolleston Primary School (FOJORPS) have organised this year's Community Day for Saturday 12 June. This is the biggest family event in the village calendar and attracts people from far and wide. All the regular attractions will be there this year, including the adventure cave, bouncy castle, coconut shy, ducking stool, pole bashing, pottery painting and pottery smashing, rollercoaster, football game and also (new this year), rollerball and balloon popping. There will be a repeat visit from last year's very popular salsa band, with even more musicians for an even bigger sound, and the children will be entertained by the Pinxton Puppets. Refreshments will be on sale all day, both in the school hall and from the barbecue on the field. A large number of local organisations will be represented, including, the Playgroup, Rolleston WI, Scouts, Parish Council, St Mary's Church, Myasthenia Gravis, Civic Trust and RSPB. The prize draw will have some really fantastic tickets - British Midland air tickets, Derby County FC tickets, golf at the Craythorne, a Nestle hamper and Tutbury Crystal. NORMANDY has been invaded again! Thirty-six members and friends of' Rolleston WI enjoyed a long weekend in Rouen, organised by Mrs Joan Price and Mrs Verity Conner. They had a wonderful visit to Monet's garden which certainly lived up to expectations. The flower borders were a mass of colour, the water-lilies were coming into flower, and they were able to walk over THE bridge. The trip to Honfleur was most interesting. The wooden church, the old buildings and the harbour were all lovely, and we were able to stroll around in the sunshine and watch the world go by. Deauville is a very pretty seaside town with a wooden walkway called the "plancher" all along the beach and, although the sea breeze was bracing, we had a good walk and enjoyed looking out for celebrities. Walking beside the sea is not, after all, something that we are often able to do. The weather was really kind to us: we had warm sunshine for all our excursions during the time we spent in Rouen, it rained only during the night or while we were traveling.